→How to enable Search Description for blog posts in blogger? Today, I am publishing the second article of series titled “Blogger Advanced SEO Pack for Beginners and Advanced Users”. In this post, I will show you, How you can use the Search Description for getting best result in SERPs. Search description is really important for attracting the targeted traffic to your blog. It informs the visitors about the type of content present inside a particular blog post in SERPs. WordPress users can use different SEO plugins, which simplifies their work but what about Blogger users? Can they modify the Search Description according to their need? The answer is “Yes”. If you don’t know anything about “Search Description”, don’t worry. I will deal everything. What does Search Description Mean? When we search for anything in Google or any other search engine, it returns some results which contains the Title, url address and some description. Title appears first, followed by link and Search Description. It is “Search Description” which gives idea to your users about the content. If they find it helpful, they visit your post otherwise they look for some other post. For understanding it better, have a look on below given figure which shows, how “Search Description” appears in Search Engine Result Pages(SERPs). Have a close look on above given figure. The first result contains relevant Description so user will find it helpful and will love to check the article. On the other hand, the second result doesn’t look promising because it doesn’t contain relevant Description. Most of the time, users doesn’t visit such links. Once done, click on “Save Changes” button. 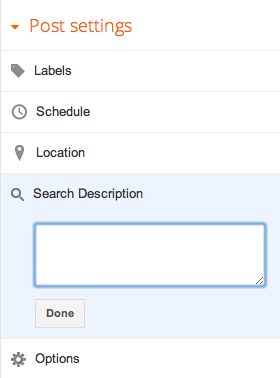 Doing this will enable search description for blog posts. Enjoy. How to add Custom Search Description in Blogger Blog Posts? After doing this, you will see a Text Box. Just write your desired Search Description. While doing so, make sure that it only contains 156 characters because search engine doesn’t show more than 156 characters in their results. Also make sure that, it contains relevant information about your blog post. Once done, click on “Done” button and enjoy. You Might Also Like –How to index a new website or blog within 5 minutes in Google? Why Custom Search Description is Necessary for you? As you all know, Search Description gives users, a brief idea about the content of a blog post so it should be relevant all the time. If it is not relevant , user will not visit your blog or website. Always remember “Your first impression is your last impression” and your first impression appears in search result in terms of Title and search description. If you haven’t enabled the search description for blog posts in blogger, it will automatically add search description to your blog post based upon the content. However, there is no guarantee that it will always add relevant search description. I have noticed that, it adds irrelevant search description so many times so it’s always better to use Custom Search description for blog posts. If you have facility, use it. Most of the time, a video or a Picture blog only contains Videos and Pictures. It means, these blogs contains very less textual contents. Automatic search description facility provided by blogger fails in this scenario. It happens because automatic search description are generated on the basis of textual contents. In such blogs, enabling search description and then using Custom search description in blog posts are necessary. After doing that, your title will contain a relevant search description about the video in search results. User will come to know about your post. It will increase the number of visitors in your blog. In the above figure, You can clearly see that, there is very few texts but still, it will show a relevant Search Description in SERPs(Search Engine Result Pages). That’s the benefit. If you are a blogger user, I will recommend you to enable Search Description for posts. After that, always use custom search description for adding relevant description about your posts. Believe me, it will increase the number of visitors on your Blog. The above written steps are quite clear and easy to follow. However, if you are still facing any difficulty while applying them, feel free to ask me via comments. If you liked it, don’t forget to say thanks.